Did you know that everyday about 172,800 websites are created? That’s means that a blog is created every 2 seconds! Starting a blog is a huge leap for most businesses. This was because it became a great way to establish your brand. But do you know what’s a critical step in creating your blog? That is choosing your web host! Picking a web host is as tricky as picking the topics from your blog. Imagine hundreds of web hosting companies luring you to subscribe with flashy gimmicks and great sales talk. But when you think about it, why just go pick a web host that has proven itself over the years? That’s when Cloudways comes in. 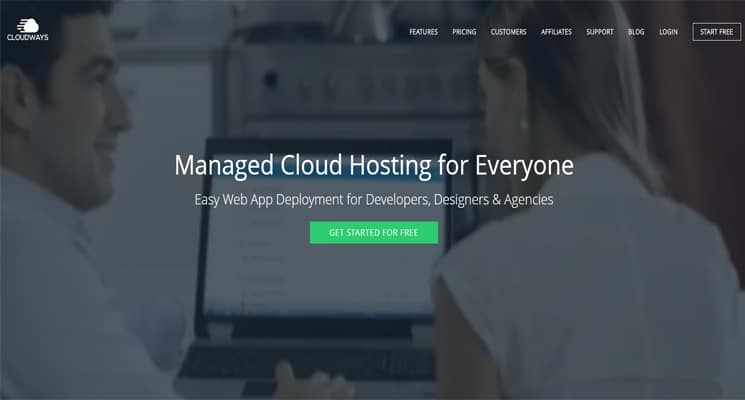 Cloudways is a pioneer among web hosting companies and has earned the trust of many internet giants including Forbes, VentureBeat, 451 Research and more. Today we have Danish Ashrafi from Cloudways. He is going to answer our questions about web hosting and the company. It’s an honor to have you here Danish. First off, we’d like to know more about Cloudways. Can you share to us a brief overview of the company and the people behind your success. Thanks for having me! It’s an honour to be asked for this interview. Cloudways is the brainchild of 4 guys: Pere Hospital, Aaqib Gadit, Uzair Gadit, and Umair Gadit. And recently we’ve added a new cloud service provider, Kyup, which provides more flexibility and auto scale up functionality without downtime for your website. It further provides rebooting the server, if your server continuously keeps hitting the limits. Cloudways is a pioneer in the web hosting industry. As one of the most established companies in web hosting, can you tell us what makes a great web host? What should customers look for in a web host? In my opinion, one should always look for a Reliable Host which offers uptime guarantee. Hosting should have flexible upgrading options when needed and most importantly hosting platforms should have pliable interfaces in order to manage multiple applications side by side server performance easily. However, The most common issue with hosting companies these days is that they don’t allow unlimited domain for user flexibility. This is where Cloudways beats it competitors as it comes with reasonable price plans starting from $5. The 24/7 customer chat support is a plus as it is available 24/7. Cloudways provides more flexibility than any other hosting providers and all of the above. So Cloudways has been in the industry since 2011. Based on those 5 years, what are the most common features that people look for in a web host? What can you say have improved since you first started in 2011? Cloudways is now known as one of the biggest & famous cloud hosting provider. Since 2011 we have successfully accomplished many goals. You can check them on our timeline, simply click the link below to get an overview of our venture. Do you mind giving us a quick run-through of Cloudways’ major offerings? 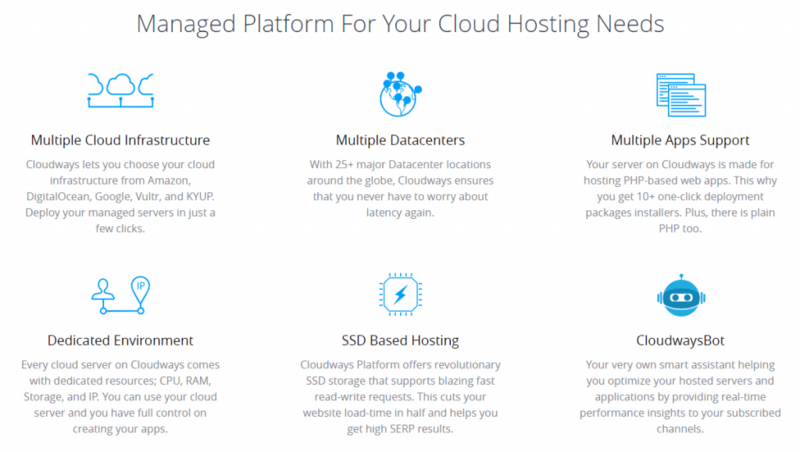 Some of the key features that I would like to mention for Cloudways hosting are, Cloudways lets you choose your cloud infrastructure from Amazon, DigitalOcean, Google, Vultr, and KYUP. And gives you the flexibility to deploy your managed servers in just a few clicks. Cloudways offers you to choose the datacenter locations around the globe, We ensures your targeted audience where you want to market your product and services don’t face any down time. With Cloudways you get dedicated resources for each server that you launched; CPU, RAM, Storage, and IP. You can use your cloud server and you have full control on creating your apps. All server contains SSD drive which provides blazing fast read-write requests. Cloudways provides you your very own Bot assistant which helps you in keeping your application optimized properly on real time. For the benefit of our readers, can you tell us what’s the major difference between the plans you offer? What would you recommend to those who want to try your services? For example I am a newbie entrepreneur and want to start my own blog. Which plan would work best for me? Is it possible for non-techie people to complete tasks without the supervision of a professional? Cloudways provides very easy user friendly interface to manage various application easily even a non technical can manage easily without any supervision. And for newbie startup blogs, I would suggest to choose the Digital Ocean $15 plan, on initial basis. Then gradually when you start getting more traffic you can easily scale up your server configuration without any downtime. Some bugs happen during migration and some WordPress plugins don’t get carried over as well. How does Cloudways manages to keep everything the same during the process? How do you guarantee a smooth transition between web hosts. But yes complex websites does some problems sometimes but our support team is always here to help 24/7. A lot of websites have been rendered useless by hackers. Hacking is a grave threat to most businesses big and small. How does Cloudways avoid this? How secure is Cloudways? 1. On server level we have automated systems to apply patches and updates, and each server is secured with firewalls to protect against malicious traffic. 2. We have recently launched CloudwaysBot, it notifies our clients if they have outdated versions of plugins, themes and core files. 3. We have 2FA support on CW main login page and we do have our custom platform that does not have any security vulnerabilities that come up like in Cpanel. 4. We also encourage users to use security plugins and extensions on their WordPress, Magento, Drupal etc. websites. We are in partnership with Sucuri and our clients can purchase it on discounted rates. 5. Each of our servers are backed up every day by default. Our clients can increase the frequency of backups to one backup per hour. 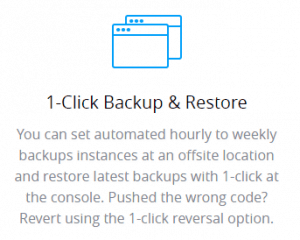 We maintain these backups on AWS S3 that are separate from our client servers. If in any event client website is hacked or compromised we can easily restore it with just a click. We retain 14-days worth of backups. Cloudways supports a wide variety of applications that people commonly use to create their own websites. Are you guys planning to expand your current list? Are there any new features that we might expect you to add in the near future? We definitely have plans to support more applications as it is very easy for us to add any Open Source PHP CMS or framework on our servers. Thank you so much for taking the time to answer our questions Danish. We wish you great success in your years to come. There you have it folks! Any comments or suggestions? Please post it in the comment section below.